This plush foundation brush works liquid and cream foundations of all coverage levels into the skin with an airbrushed finish. 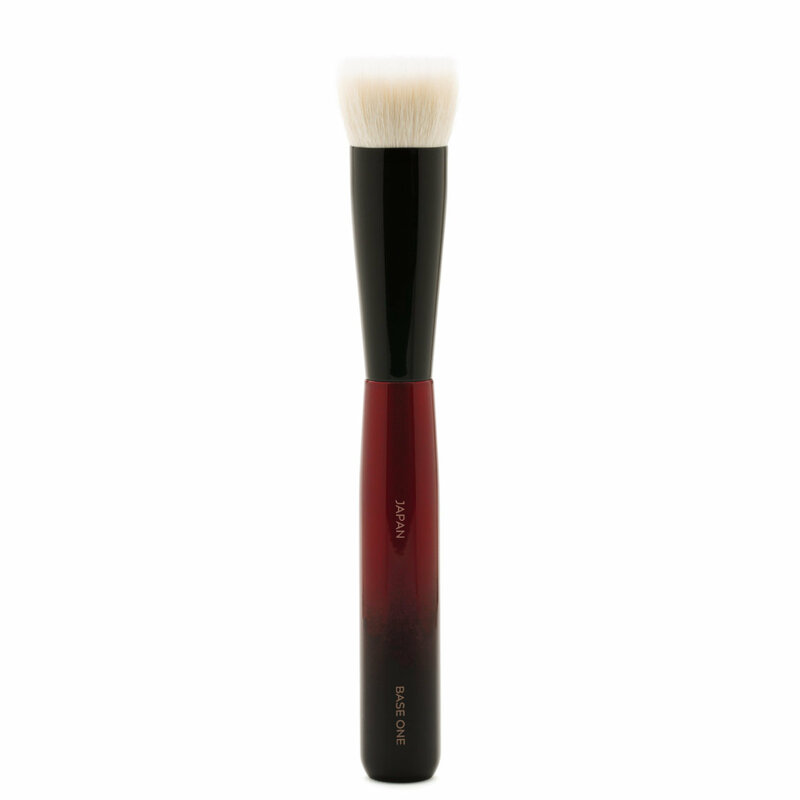 With a perfectly calibrated mix of goat hair and synthetic bristles, Base One is dense yet airy, making it an essential tool for applying a full face of makeup quickly and easily. 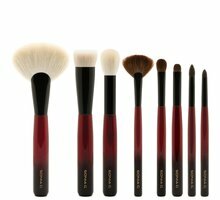 “This brush’s shape and density work beautifully with liquids and creams. It’s strong, easy to clean, and quick-drying but also airy enough to blend blush, bronzer, and highlighter.” — Sonia G.
Despite its dense, velvety bristles, Base One rinses clean easily when you wash it and dries in a snap. Each brush is handbound by master artisans in Japan using traditional brushmaking techniques for unparalleled performance and craftsmanship. The sturdy handle is made from dense, sustainably harvested maple wood and coated with four layers of pigment and lacquer for a rich, dimensional finish. To apply liquid or cream foundation with sheer to medium coverage, pick up product with the tip of the bristles and stipple onto the skin, in short, downward motions. For a quick wash of foundation, use larger circular motions. For cream blush, bronzer, or highlight, pick up the product with the brush and apply it directly, or place it onto the face with fingertips and use Base One to blend it out. I am unsure about this, it feels dense but not as soft as other brushes of this type. It felt like it was exfoliating my skin as opposed to placing foundation, and it soaked up quite a bit of liquid foundation. Also the handle is very thick and long, akward to use, so this sadly does not work for me and my needs. I love other Sonia G brushes so I thought I would like this one too. Sadly no. I agree with the previous reviewer. It exfoliates my sensitive skin, moves the foundation around, and soaks up a lot of foundation. I had to use 2.5x more liquid foundation than what I normally use. Also, it is too dense and small to freely buff around quickly - definitely not what I need in the busy morning. Firstly I should confess that even as an all out brush addict, foundation brushes are my favourite brushes of all and I am consequently, pretty fussy when judging a new one. Sonia’s Base One is undeniably gorgeous to look at and a lovely weight to hold. It is however a little chunky in the handle and also a bit longer than I would prefer. That said, I achieved a pretty much flawless foundation application with almost no effort at all; without a single hair shed and still had product on my palette left over since it soaked up less than my favourite go-to base brush. If it were an option I’d be giving this brush 3.5 stars, the thickness of the handle IS a bit of a problem for me but the quality of finish I achieved with it makes it worth sticking with it and finding a way to get comfortable using it. Ultimately the result justifies that, it’s a very nice brush. Wow I love this brush. Super soft super dense and blends my foundation to a, dare I say it “airbrushed finish”. I have tried tons of brushes over the years and my go to for the past two years was my beloved Rae Morris liquid foundation... much love, but I think I like this one better, maybe not the feel as much, but the finish is truly amazing. The handles on these Sonia G. Brushes are to die for. Well done Sonia for a truly fantastic brush collection. I love this brush for cream blushes. It didn't work for me as a foundation brush at first. I recently watched Wayne Goss' video 'How to really use a foundation brush' and it was very helpful. I was using this brush wrong all along. His tip for hybrid brushes is basically using thinner layers and building up by using a stippling motion not brushing on. The brush is beautiful, great craftsmanship. I have tiny hands, so the brush is a little bigger than I would like but I enjoy it nonetheless. So i’ve tried it with all my foundation from liquid to cream to stick and wet brush on pressed powder foundation. Unfortunately it leaves streaky marks with all kinds. Also feels spiky. Like some says, feels like I’m exfoliation while putting foundations on. Not sure if I’m doing anything wrong but temptalia says she’s having the same problem and she’s professional. The handle looks beautiful so an extra star for that. It's unfortunate this brush didn't work for me. I love all other SG brushes, but this is not as good as my Artis, Sigma, or Real Techniques for applying foundation. It's a duo fiber and not as densely packed as her other brushes (or the dense Artis). So there is more 'give' in the bristles when applying foundation -- rendering streaks upon application. You have to use very little foundation and apply in layers if you want to avoid the streaks and to have more coverage. On this front, I guess it works. But it just takes too much time that I often don't have. Wow, this one is just unbelievable. It blends foundation to an air brush finish no matter the texture of your skin. Foundation is not streaky and it does not catch into dry areas. Just amazing! Application is a real moment of pleasure that does not last very long as "unfortunatelly" it does its work in just some seconds! Well done Sonia!! In the past I have not been a huge fan of foundation brushes. This brush has changed my opinion. I like how it doesn’t leave streaks on my face. It blends my foundation in really well leaves a smooth finish. I am a huge fan! When I first used this brush I was disappointed. It left a streaky awful finish to my foundation. After watching WGs video on this style of brush I immediately tried again using half as much product and it was perfection!! I am still having trouble around my nose area but I’ll get there with more practice I think. So I’m now using much less product and getting a great finish!